Is there any other sport besides running where a lack of experience is considered a good thing? Where not being good at the sport makes your achievement somehow more impressive? I love running and I would love it if every person in the world became a runner. That said, I'm kind of tired of reading stories that start with "So-and-so had never run a step in her life before deciding that she was going to run the New York City Marathon." I feel like this is the equivalent of me stating that - despite not knowing any of the rules of football - I'm going to win the Superbowl next year. That's the weird thing about running, isn't it? We're all in the same race, from elites to back-of-the-packers. We all get the same accolades and looks of non-comprehension from our friends when we roll in to work the next day, whether we ran a 2:52 or a 6:47 marathon. I have always wondered that too. I'm not sure waking up one morning and deciding to run a marathon is as commendable as people think it is. It's a really good way to get hurt. Woo for being above average on half marathon time! I am not sure I even knew exactly what a marathon was when I first ran a 5K. I think its odd, I mean, if you don't enjoy running, training for a marathon would be really boring. Some of my "non runner" friends got injured, including one who took 1 week off too many during marathon training, and got injured during a 15+ mile training run...It's hard deciding whether to be supportive or say you are risking yourself with your training. I feel the same way. I'd been running for 7 years (since high school) before I ran my first marathon in 2010. Not only was it not really feasible to train for one before graduating from college, but I don't think I would have been mentally or physically ready sooner than that. It also kind of annoys me that people jump on the NYCM train having never run a step simply because it's popular, not because they genuinely love or have a passion for the sport. I think that's what bothers me - it somehow feels like they're not taking running seriously, you know? That's one thing I'll say for NYRR's 9+1 program: at least it forces people to do a fair bit of running in advance of the marathon! I know someone who plans to run the LA Marathon in March. She's never run any other race aside from a Tough Mudder. I suggested doing the local 5K or 10K Turkey Trot but she looked at me like I was crazy. Maybe she doesn't think she'll get enough likes for running that distance. Yes. Yes. Yes. Your last sentence sums it up perfectly. The marathon has become some sort of goal that exists entirely outside of running. I guess it's just manageable enough for (almost) anyone to be able to do it, but impressive enough that everyone wants their friends to know that they *did* do it. Hey, I got that email too! Now I wish I'd actually looked at it. And I fervently agree with what you and Cindy were saying upthread; I think it's absurd that people nowadays get a pat on the back and a gold star simply for SIGNING UP TO DO A MARATHON. It's my third least favorite thing to hear about running, the second and first being: "it's an accomplishment just to finish!" and "I only run when I'm being chased! LOLOLOLOLLLLL!" I've met a few people who woke up one day and decided to check a marathon off their bucket list and proceeded to never run again. This makes my eye twitch! W. T. F. I cannot stand the'bucket list' marathoners! Especially the ones that go out and BQ for their first race and they don't even fuc*ing know what BQ stands for! True story. Happened. Still hate her. I think that's BS. I was a runner for a year or two, and wanted to do a marathon partly just to try it. I didn't know if I'd ever do another one after that, but I wanted to do the distance just so I could have the experience of doing it. If someone trains for a marathon, I have no qualms with them saying they've done it just to cross it off a list. 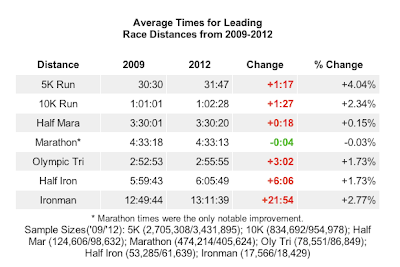 Who knows, they may never run another marathon, but they may continue to run in some form. I have no qualms per se, but I'm definitely conflicted about it. WIthout delving into the "real" runner debate, it just seems like... less somehow. Like Dancing with the Stars (which I also hate), where they take non-dancers and train them to perform. i got that email as was thoroughly annoyed by it. But also 3:30+ for a half marathon?? 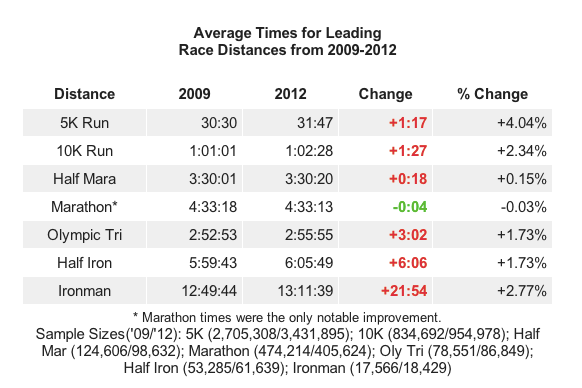 But anyway, with the growing popularity of walking races, and the Galloway method, why is this surprising? I saw this article in the WSJ today and totally thought of you. I tend to race in the bottom third when I get to race... so I laughed when I read that it might be better for me than being "good" at the sport.